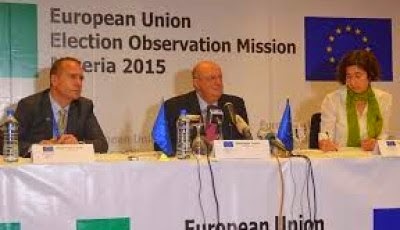 International election observers today called for the cancellation of the Governorship and House of Assembly elections in Rivers, according to a report by the News Agency of Nigeria. The leader of African Centre for Leadership Strategies and Development, Humphrey Bekaren, who spoke on behalf of the observers, made the call in Port Harcourt. He said the observers were shocked that INEC disregarded the widely reported violent irregularities to begin the process of declaring results in the state. "We request all lovers of democracy to join us in calling for the outright cancellation of the phony election. Unless this is done, we would have sown the seed that could eventually grow into providing a shade of fear and death over us,’’ he said. According to Bekaren, what happened in Rivers was a far cry from what election should be. "What we saw did not meet international standard of electioneering, not even the ones set by the Independent National Electoral Commission INEC,’’ he said. He said there were reported incidents like deliberate delays and diversion of electoral materials, attacks on electoral officers, widespread arson and voter intimidation. The Resident Electoral Commissioner for Rivers, Mrs Gesila Khan, said INEC cancelled election in centres with reported electoral malpractices. She said re-run elections took place in six local government areas in the state where electoral malpractices were reported.